Hardeep Singh Puri, Minister of State (I/C) of Housing and Urban Affairs has stated that “Public space is an opportunity to display creative artwork. Not only does it beautify the cityscape, it also captures its soul. It is marker of history, capturing a city’s evolution through generations. It reflects and reveals the social, cultural, economic, and political transitions a city witnesses, and humanizes for the citizens the built-up area of their urban centres. Most importantly perhaps, public art is inclusive and epitomizes urban living, by bringing together different disciplines and backgrounds, communities and sensibilities” he said. 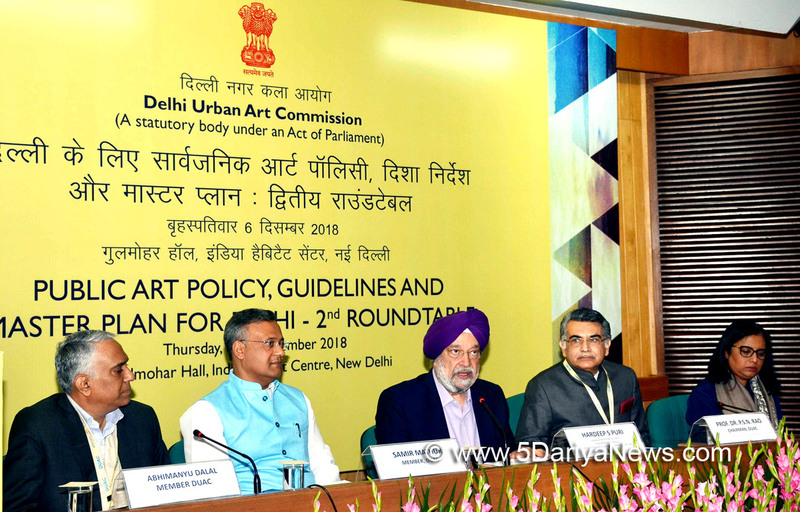 Shri Puri was speaking at the second roundtable on “Public Art Policy, Guidelines and Master Plan for Delhi”, organized by Delhi Urban Arts Commission (DUAC), here today. Various stakeholders, including artists, government agencies, Urban designers and planners were present at the occasion.Appreciating DUAC’s efforts, Shri Puri said that to reimagine the public art in our National Capital, the Commission studied the leading world cities to prepare a public art policy, guidelines, and master plan.“DUAC did so as a part of its mandate to suomotu undertake studies and frame guidelines on this important issue for New Delhi”, he said. To ensure planned aesthetic development of city’s public space, the ministry of housing and urban affairs has asked the Delhi Urban Art Commission (DUAC) to finalise guidelines for public artwork soon.In his opening remarks, chairman of DUAC, Shri PSN Rao said, “we need to identify locations, make a comprehensive art master plan and provide for guidelines for sanctioning artwork and its maintenance”. The draft framework has already been discussed with India’s finest artists, designers, architects, and urban experts at a round table discussion held in January 2018.During today’s round table, various stakeholders listed their concerns and suggested measures that should be included in the guidelines.The issues ranged from maintenance and protection of artwork, to appointment of advisors for selection of artwork.The City’s Public Art Policy provides a framework of principles to support the City’s commitment to the experience of art in the strategic planning of the city and the implementation of sustained development. The Strategy builds on the legacy of the past, while responding to new ideas about art, storytelling, interpretation and cultural expression. The Strategy identifies a series of opportunities and approaches to providing public art ranging from community based local works in village centres, to iconic new major art projects attracting business and visitors to the city.